15% off your order - see code in orange band above. 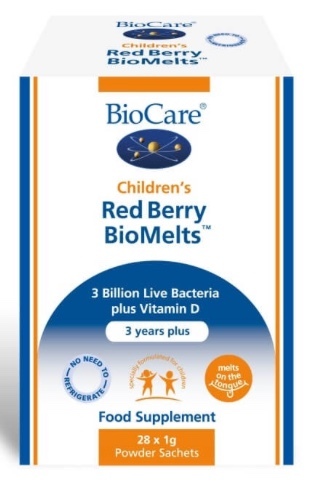 Individual sachets of unique live bacteria with vitamin D. A delicious, natural red berry flavoured powder that melts on the tongue. Convenient stick sachet to take with you on-the-go! Bulking Agents (Erythritol & Xylitol), Glazing Agents (Silicon Dioxide, Mono- and Diglycerides of Fatty Acids), Anti-Caking Agent (Magnesium Oxide), Maltodextrin, Citric Acid, Lactobacillus rhamnosus, Bifidobacterium lactis, Carboxymethylcellulose,Binder (Sodium Carboxymethylcellulose), Dextrin, Natural Flavours (Strawberry & Raspberry), Modified Corn Starch, Sucrose, Acacia Gum, Antioxidants (DL-Alpha Tocopherol & Sodium Ascorbate), Medium Chain Triglycerides, Vitamin D3 (as Cholecalciferol). 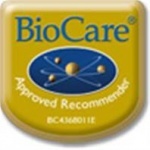 One sachet taken daily, directly onto the tongue, alongside food or as professionally directed. If you are under medical supervision please consult a doctor before use. 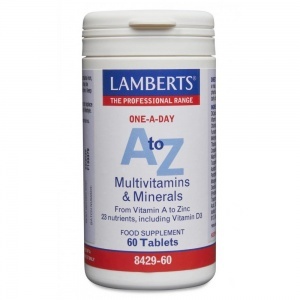 Lamberts A-Z Multi is an excellent multivitamin health supplement for those 13 years and upwards, especially those whose diets may be based on junk food. 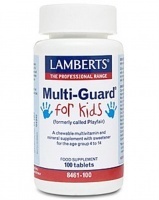 Lamberts Multi-Guard for Kids - chewable fruit flavoured multivitamin and mineral health supplement for children 4 years and older. (sugar free, aspartame free).